Most of us have a love-hate relationship with barbecue. While we can’t resist the smoky aroma barbecued food brings, we also loathe the unappealing smokiness which subsequently lingers onto our shirts. 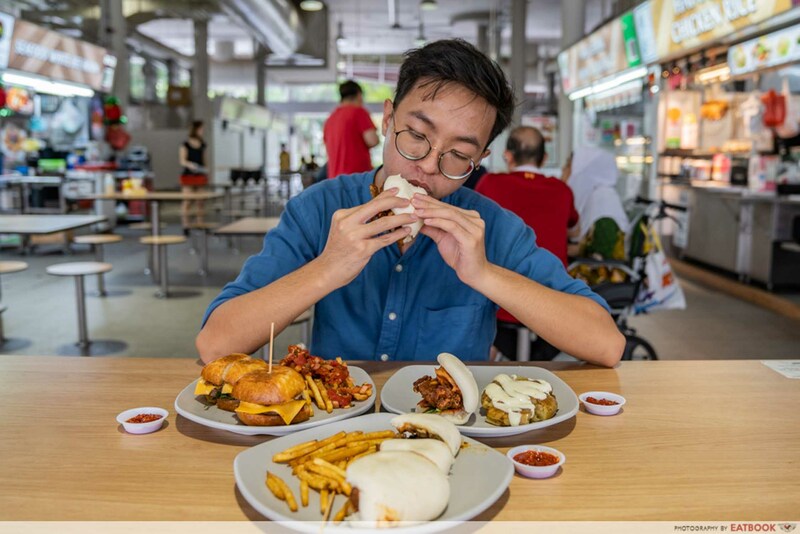 The Outslider at Yishun Park Hawker Centre seems to have found a solution for the conundrum. 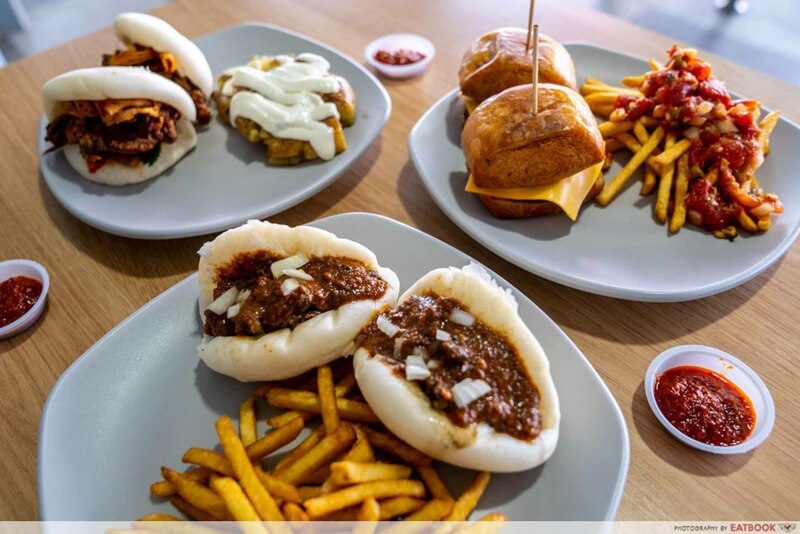 Smoking its mantou sliders with a customised portable smoker, diners can enjoy smoked sliders without relegating their clothes to the washing machine. Prior to being served, the assembled sliders are smoked in a closed container. 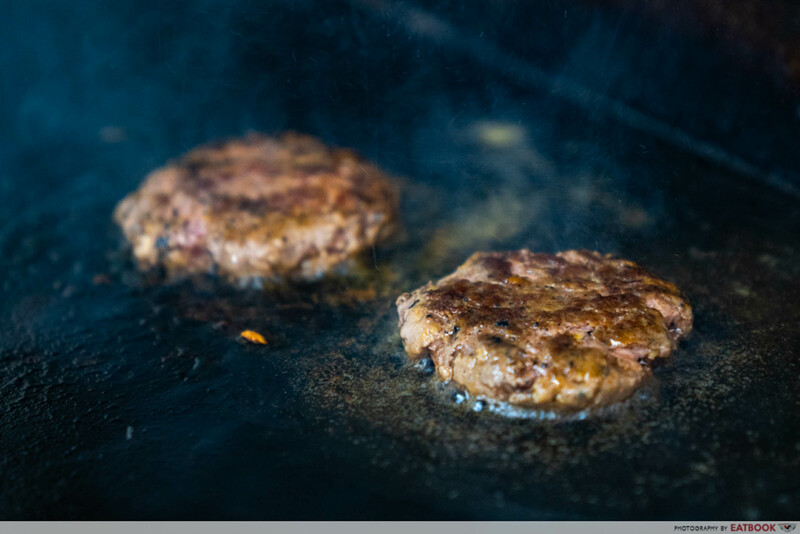 Produced by burning a combination of dried oregano, lemongrass, mint, and hickory wood chips, the smoke perfumed the sliders with a deep woodiness and refreshing mintiness. 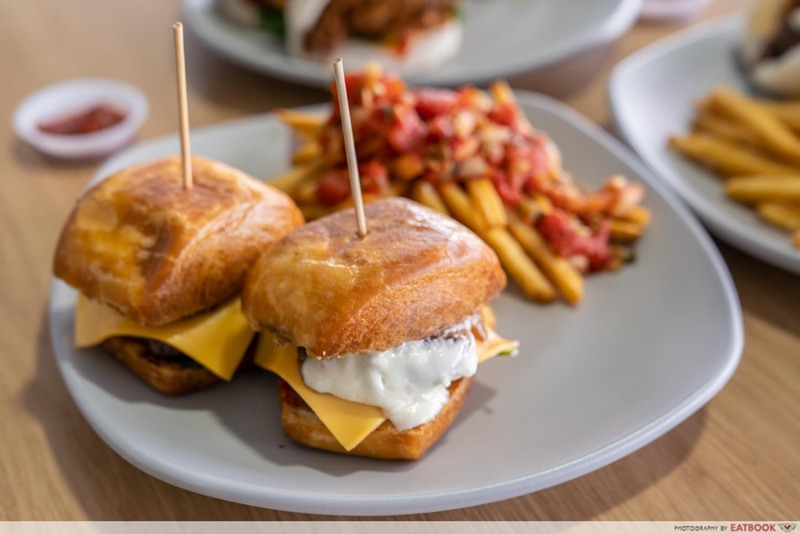 In constructing their signature Soft Shell Crab Sliders ($9.90), two pieces of mantou are smeared with a dollop of house-made garlic mayonnaise and sesame chilli. 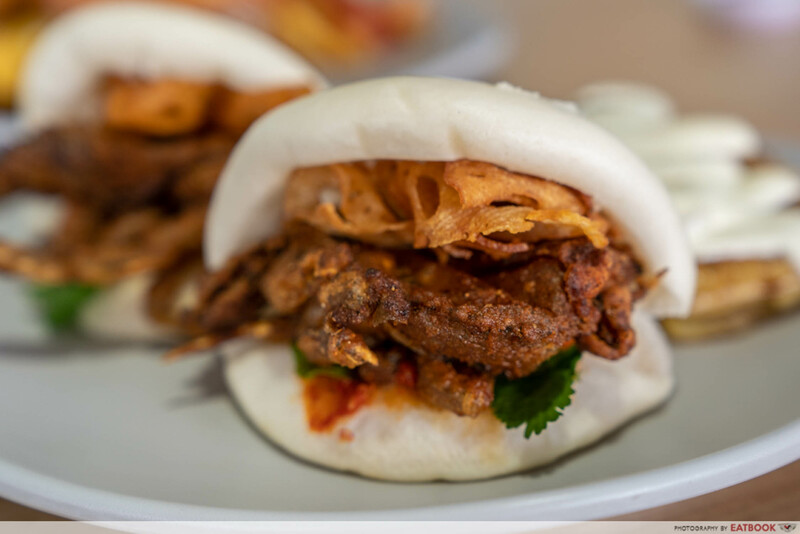 These buns form a pillowy foundation for the golden brown deep-fried soft-shell crab to rest upon. An unorthodox ensemble of mint, coriander, jalapeno and fried lotus root crisps completes the dish. Take note that the Soft-Shell Crab Sliders are hot sellers and run out the fastest. 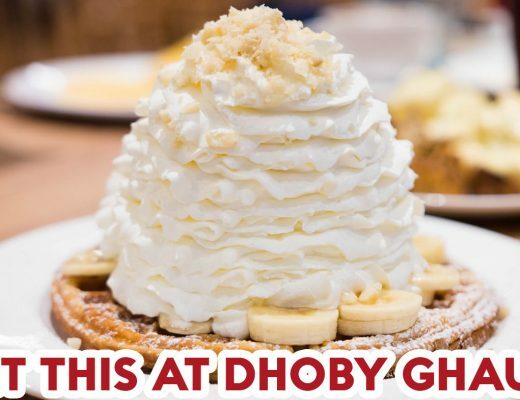 Be sure to drop by early if you are hoping to feast on these decadent treats! What stood out for me was the harmonious medley of flavours and textures. 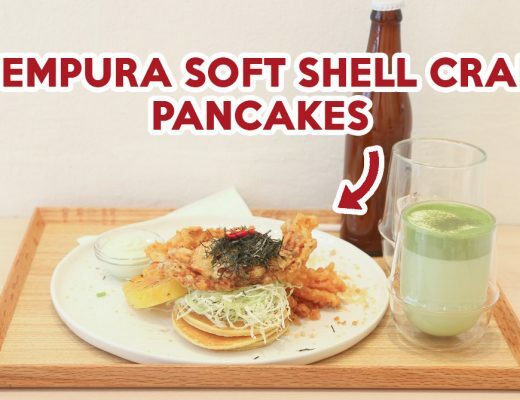 Coated with a flour mix used in karaage before deep frying, the crab boasted a loud crunch, which contrasted well with the fluffiness of the mantou. While the crab was heavily seasoned with salt, its robust savouriness complemented the sourness of the jalapeno. The unlikely star of the show was the unassuming mint leaf hidden within the sliders. The freshness of the mint, amplified by the minty fragrance of the smoked sliders, cleansed your mouth of the crab’s oiliness. 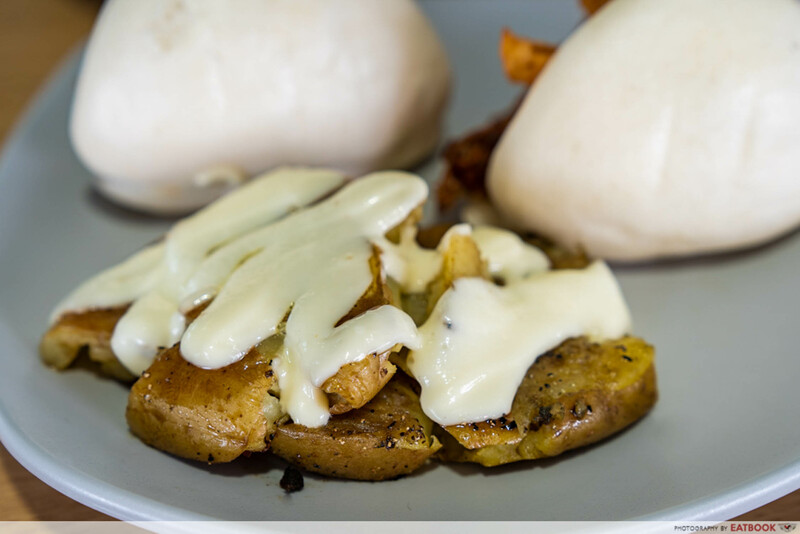 We also enjoyed how their Western-style sliders incorporated a vegetable rarely used outside of Chinese cooking: the lotus root chips. 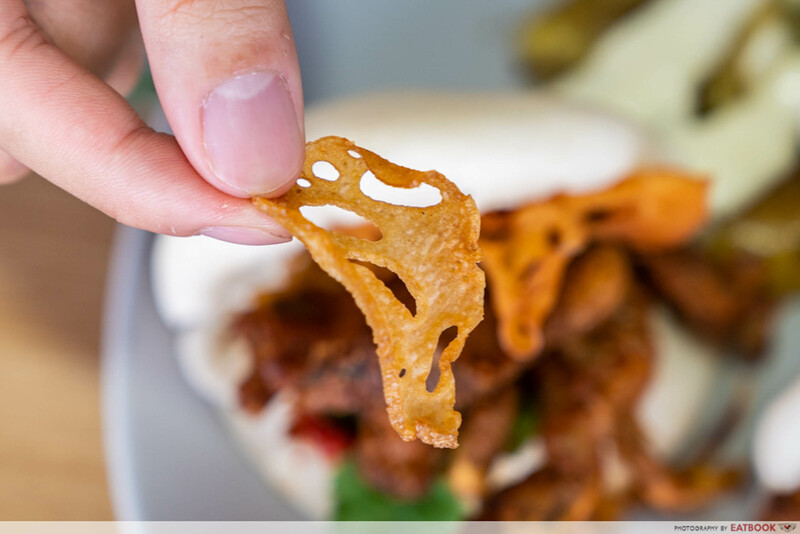 Playing upon its crunchiness, the paper-thin lotus root slices combined well with the fried soft-shell crab to produce an addictive crackle in your mouth. Each pair of sliders is accompanied by a bountiful spread of simple, lightly salted fries. If you crave variety, upgrade your fries to either the Smashed Potato or Salsa Fries for $1. In preparing the Smashed Potato, a battered Russet potato is grilled in butter and liberally drizzled with garlic mayonnaise. Although the butter gave the potato tinge of flavour, it created an unctuous coat around the exterior. The greasiness of both the potato and mayonnaise will, unfortunately, leave you bloated after several bites. On the other hand, their Salsa Fries will be great for those who enjoy more flavours in their fries. 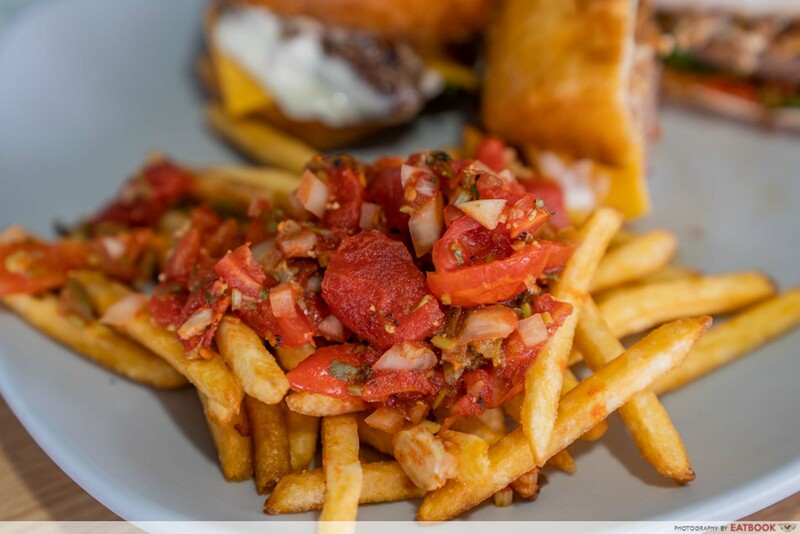 As the mellow sweetness of the cherry tomatoes and zesty sourness of the jalapenos were released into the fries, each mouthful of fries carried a refreshing tang. Special mention goes out to their house-made sesame chilli and its painstaking preparation process. Dried chilli are soaked for several hours before being boiled. Subsequently, fried sesame seeds are blended with garlic and added to the chilli. 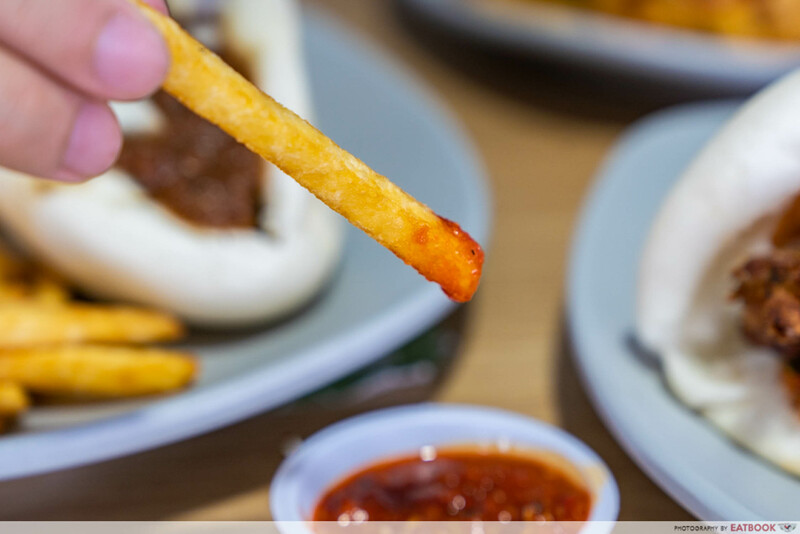 The result is a savoury relish infused with the nuttiness of sesame seeds and sweetness of garlic, which paired well with the fries. As their Beef Satay Sliders ($8.90) were recently introduced to the menu, we were eager to try the dish. 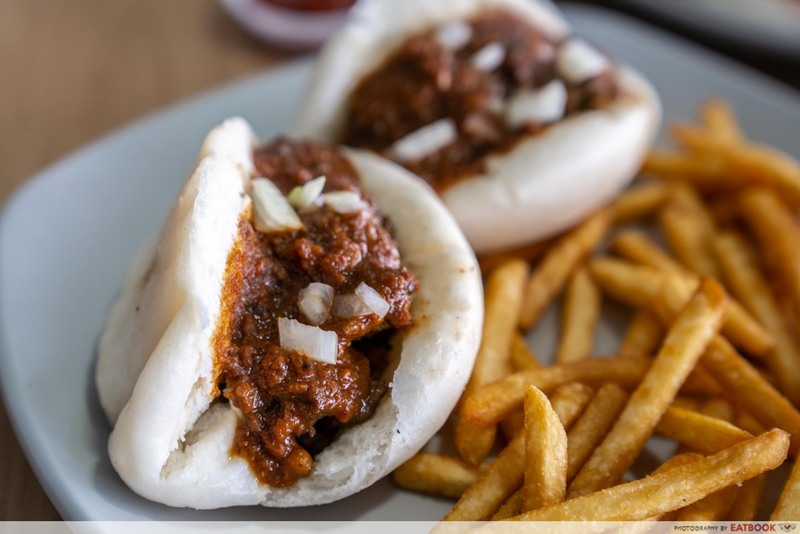 You’ll get steamed mantou buns piled with diced beef, peanut gravy, and raw onions as garnish. If you are unable to eat beef, the stall offers Chicken Satay Sliders ($7.90) and Mutton Satay Sliders ($9.90) as well! 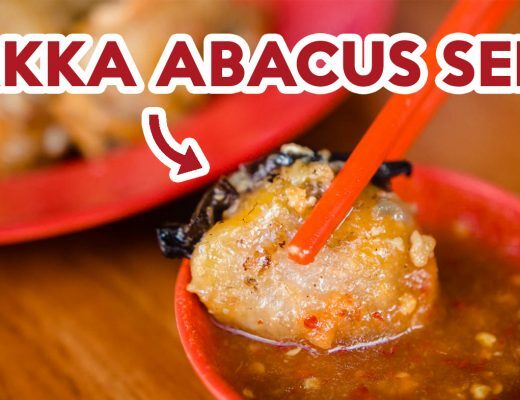 The satay sauce transformed an otherwise ordinary dish. Its nutty sweetness enhanced the natural flavours of the beef without overpowering it. Moreover, the added moisture of the gravy softened the mantou, and the coarse peanut grains was a welcome change in texture. The diced beef was mouthwateringly tender and effortlessly tore apart in my mouth. To complete our slider fiesta, we finished our meal with Beef Sliders ($7.90). 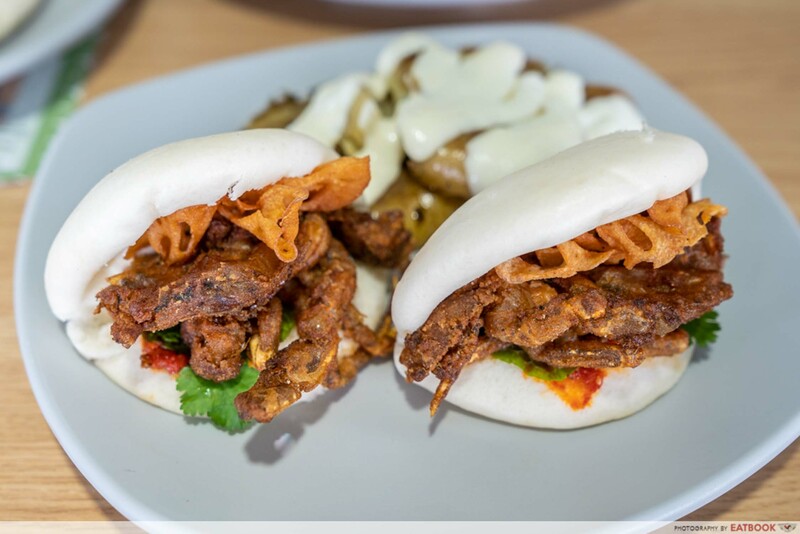 Sandwiched between fried mantou buns which were grilled with butter beforehand, the beef patties were served with a similar set of toppings as the Soft-Shell Crab Sliders, with the addition of caramelised onions and Swiss cheese. The beef patties are made of ground beef that’s seasoned with salt, pepper, and Worcestershire sauce. Breadcrumbs are also added into the mix to retain the moisture of the beef. The cheddar cheese was instrumental in melding the plethora of flavours together. 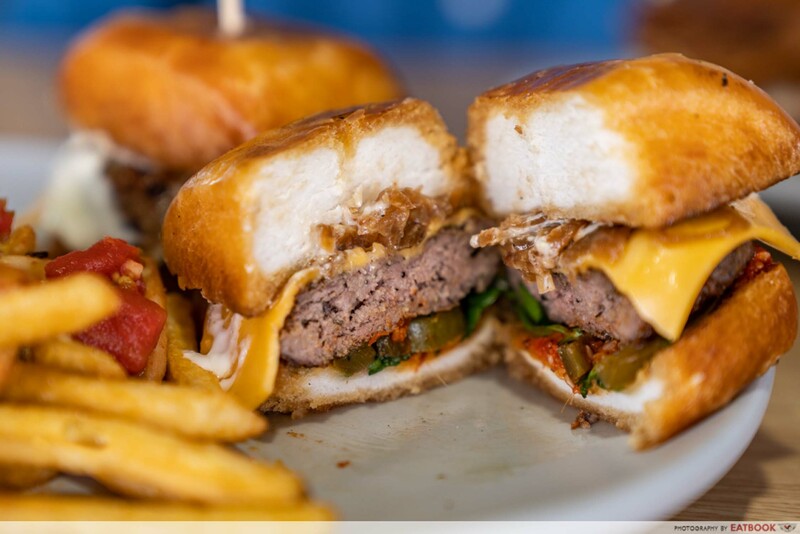 Complemented by the sweetness of the caramelised onions and the tartness of the jalapeno, the milkiness of the melted cheddar gave the burger a more full-bodied flavour. 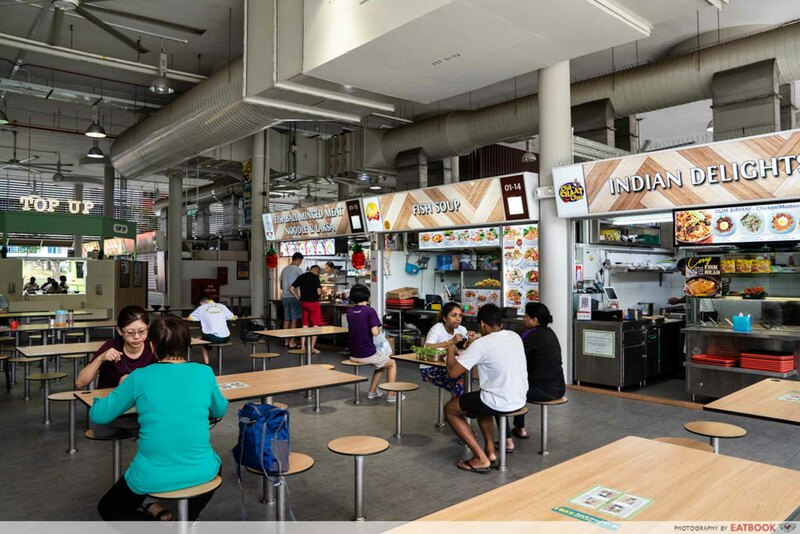 As if it was a nocturnal animal, Yishun Park Hawker Centre slumbers in the afternoon before stirring to life at night as a haunt for friends to converse over good food. For those visiting via public transport, alight after three stops from Yishun Bus Interchange on buses 103 or 806! 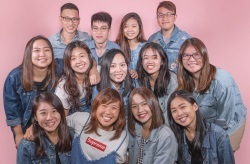 Through their playful experimentation with unconventional cooking styles, the people behind The Outslider managed to create a fusion of familiar flavours with unfamiliar ones. As you rack your brains in a vain attempt to dissect the inexplicable taste lingering on your lips, you will unconsciously be lured into making a return visit. If you are a burger aficionado, check out our review of Ministry of Burgers, a Ramly Burger cafe in Pasir Ris which boasts a whopping four-patty burger for under $10! The Outslider is a halal eatery.